Meet the Logitech CSR keyboard, which at a mere 2 mm thick, is officially the worlds thinnest keyboard. The keyboard is set to make its bow in iPad cases within the next twelve months, brining with it a whole new tablet typing experience. Its highly responsive, paper thin and delivers a totally natural typing feel. This CSR keyboard is intended to change the way that we interact with our tablet, or more specifically change the way that we input data into our tablet. A consistent complaint that we hear around tablets is that they’re great for media consuming – think watching movies and browsing the web – but they’re lacking when it comes to media creating, such as document making and movie editing. This keyboard could be a great way of changing this though, and if it does, it will succeed in an area that was a huge bug bear for the late Steve Jobs. This criticism stung Jobs when he launched the first iPad in 2010, and it was something that he worked hard to overcome in the future iterations of the device, right up until his death. So how can the CSR keyboard wor towards making the iPad a better device for media creation? 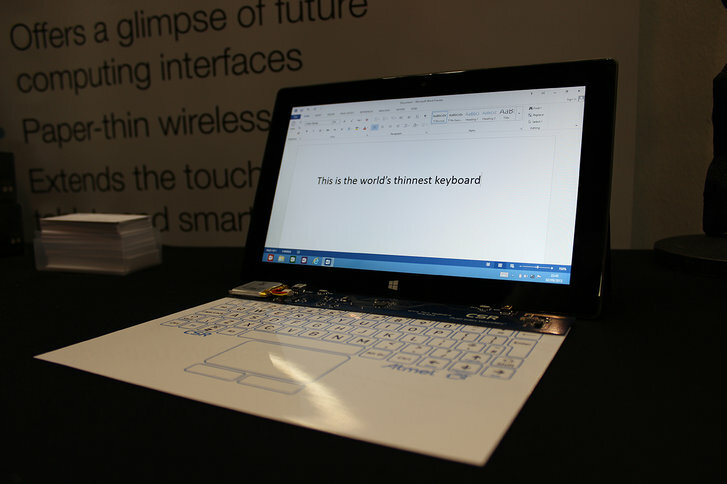 To start with, its more than just a keyboard, instead it combines in a responsive tracker pad as well as a drawing pad. This means that you can scribble down notes as well as sketches using the precise stylus pen as the input. This whole experience is underpinned by how reactive the entire keypad is, as the mere 12mS of latency is almost non-existent. Latency has been a consistent problem with other bluetooth keyboards. Bluetooth connectivity can sometimes be patchy, and many keyboards, especially those on the lower end of the market, offer such high levels of latency that they’re playing catch-up a second or more later. This delivers the sort of frustrating experience that we used to live with on ageing PC’s in the late nineties. The CSR keyboard is also highly portable, completely flexible and pretty darned hard to damage or smash. These are all good properties for any device intended to work with the iPad, considering the selling point of a tablet verses a notebook is its comparative portability. As you can see in the pictures, this keyboard bends and flexes remarkably, and can even be rolled up to fit in your pocket or bag. Impressively though, when you unroll it, it immediately ‘snaps’ back into its flat form shape, ensuring that you don’t have to contend with any annoying rolls under your finger tips whilst typing. The CSR keyboard should be priced to sell, as manufacture is going to be very cheap. The manufacturing method will not be dissimilar to 3D printing, so making big batches at good prices should not be a challenge. Its powered off a penny sized battery, and that battery delivers a usage life of 8 hours which sits roughly in-line with your tablets charge. We’re looking forward to seeing this tech hit the shelves soon.